With its attractive, low-maintenance design and generous 120-litre capacity, this waste bin is suitable for environments with heavy footfall and/or public areas such as shopping centres, museums, offices and commercial buildings. 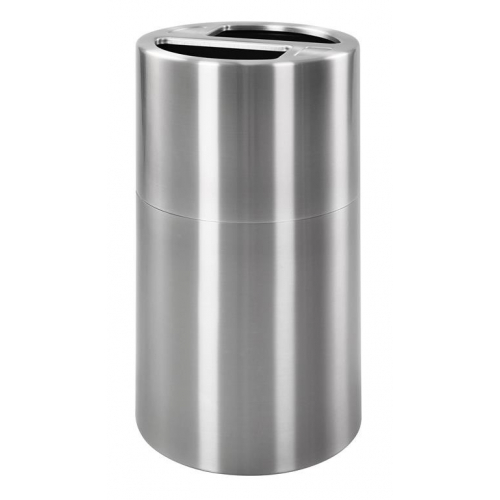 Constructed from aluminium, this bin is resistant to smears and finger prints, allowing it to be low-maintenance. It features smooth surfaces that are easy to wipe down should it need to be cleaned. Its construction material also allows it to be resistant to corrosion and is 100% recyclable. It is designed with x2 60-litre compartments giving it an overall capacity of 120 litres. It features stylish, open apertures which ensure the bin can be used hands-free. This encourages cleanliness by preventing the spread of bacteria. The lid lifts off, allowing easy access to the plastic liners.